Our hearts go out to our Windchime of Chico employees who suffered loss in the recent Camp Fire. Several of our employees lost their homes. Others also lost their cars and their beloved pets. A Medication Tech at Windchime for 17 years. She is currently staying in Redding because there was nothing available in Chico. Our Memory Care Director. She has three daughters and her sister, who has stage 4 kidney disease living with her. She lost her two pet pigs, who were like her children. Our Housekeeper for 10.5 years. Her home in Paradise burnt down 10 years ago and they had just re-built before this fire. She lost her 3 dogs, a pig, sheep and goat. She is currently staying at Windchime and has been driving around, trying to find her animals. Our Director, Culinary Services. He and his wife were able to escape. When the traffic was not moving, she got out of her car with her three dogs and two cats, and ran down the mountain to safety. The people in the cars behind her did not make it out – the doors to their cars melted shut. Our team members have dedicated their lives to helping Chico seniors. Now, it’s our turn to help them. We are the leadership team from Milestone Retirement Communities. 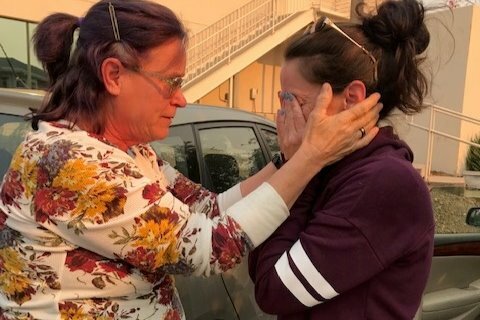 Please, consider donating to help our employees, who suffered great loss in the recent wildfires, rebuild their lives. Once funds our raised, we will be cutting checks directly to the employees affected so they may pay for some of the expenses they have incurred due to this tragedy.